When deciding on an Auxiliary Braking System for your towed vehicle one of the first questions you need to ask yourself is whether or not you want this system to be portable, with the ability to easily move it from one vehicle to another should you decide to change towed vehicles. HitchSource carries multiple brands of Portable Auxiliary Braking Systems. These auxiliary braking systems sit right on the floor under the steering wheel. With installations in seconds rather than hours, these systems are easy to use, store, and can be easily changed from vehicle to vehicle. While not needing to feed off the RV or towing vehicles brakes, braking is applied proportionately by detected inertia. Running off of the towed vehicles 12v battery, these systems use minimum energy drain to power the vehicles brakes. Each system comes with a wireless monitor to mount in your coach that can adjust the towed vehicles braking power. Permanent (or “Hidden”) Auxiliary Braking Systems can be Vacuum Assisted or Electrically Fixed. A vacuum assisted system doesn’t use your towed vehicles battery power. 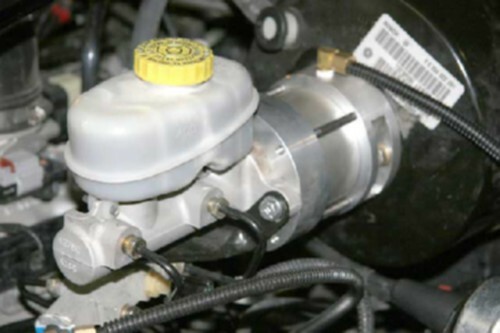 The vacuum-assisted brakes run directly off of the vacuum brakes of you motorhome. While there is a more serious installation than portable brakes, once installed your vehicle is always ready to go with the brake out of the way and hidden from view. If you’re running an RV with air brakes you will just tap into the air-brake system to power your vehicles brakes for a directly proportionate braking. However if you are using more than one towed vehicle or plan to change vehicles, a portable auxiliary braking system might a better option. Electric Fixed Braking Systems like the Vacuum Assisted Brake does not feed off the towed vehicles battery and are hidden and out of the way. This is one of the most affordable options for supplemental braking systems. Using the electrical system of the coach vehicle, the brakes are engaged at a fixed rate whenever the coach brakes. Being a non-portable unit, these brakes require a significant installation as well. 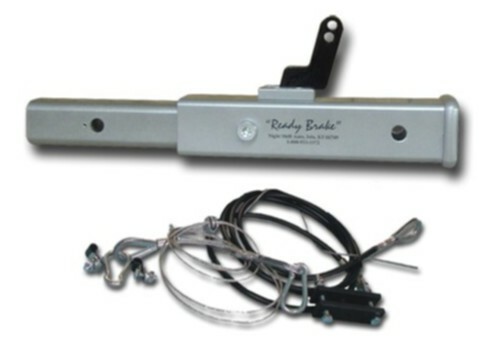 HitchSource top selling, permanently affixed Auxiliary Braking Systems are the SMI AirForce One and the Roadmaster InvisiBrake.